Thank you California Closets for sponsoring this post. Hello peeps! To take my mind off of the ORC, I decided to tackle my kids closet and organize it. If you forgot, my master plan for this year is to get more organized. I organized my closet and my kids bath, but organization does not end there. When my kids were babies I felt like we were somewhat organized…we knew where every thing was at, their clothes were neatly put away, their toys weren’t scattered, etc… Now that they are older, I feel like all hell broke loose and that our house has been in disarray. I mean, it sounds crazy, but it is true. Their closet is the root of the mess in their room. I almost never go in their rooms because I cannot stand all the crap laying around and the clothes scattered everywhere. It bothers me to my core and turns me into the hulk. I felt a bit of relief when California Closets chose me for this campaign. I had my pen and paper ready with my list of question, because y’all know, I can make something look pretty, but my organizational game is dead. Just look at these pictures. Nothing is staged here, this is real life folks. Since I do not have a California Closets Showroom located near me, I ended up doing an email/phone consultation with them. My consultants name was Jessica. I sent her pictures of the closet in question and asked her slew of important-to-me questions. What I appreciated most about this consultation was that although everything was sent via email, she was very prompt and she made me feel like this was a problem that could be solved. I was extremely embarrassed to send her images of my kids closet because as a home decor blogger everyone assumes that my house is neat and tidy, 24/7, when in reality, it is not. Here are some of the questions I asked her along with an after picture. 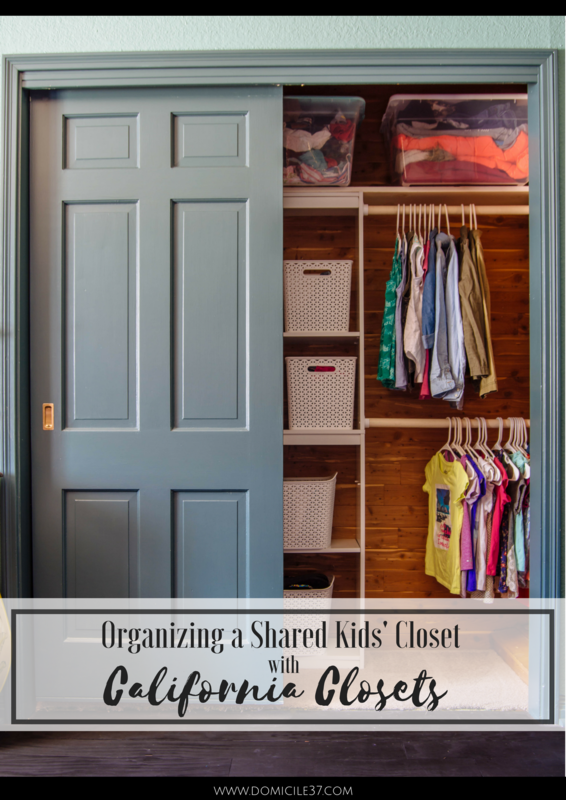 How do you go about organizing a shared kids closet? She responded to me by letting me know that there is not exact formula to how many shelves versus hanging clothes kids should have. 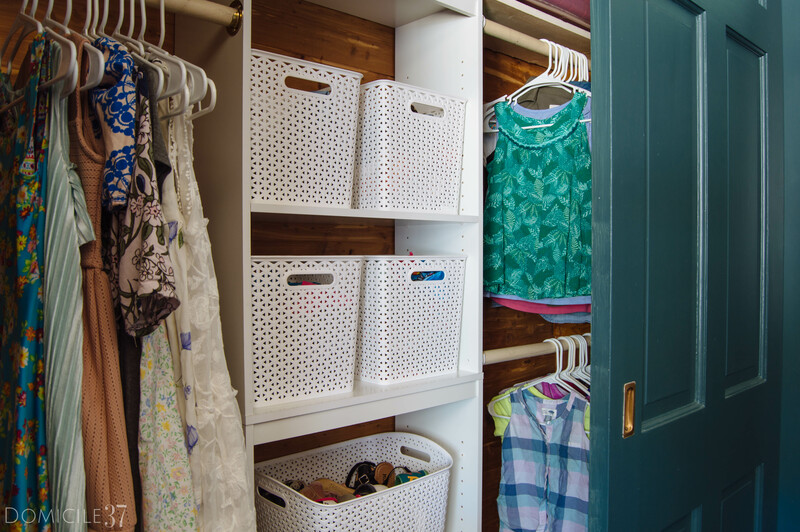 Since this closet spans 16 feet she expressed how important shelving is in this space. If you look at the before picture, we weren’t utilizing the shelving the way we should have which eventually led to clothes just being piled and thrown into the closet. Are their any magic bins or anything that can help? I did not want to start from scratch and rip out what already was in the closet, so Jessica suggested getting more free standing shelving/slide out bin components to help organize everything that isn’t hung. She stated that by using them it can help clean up the overall look of the space and compartmentalize a number of items. To be honest, I was personally on the fence about buying bins to house their clothes because I personally think folded clothes look better on a shelf. However, after taking in her consideration and purchasing the biggest, most durable bins that I could possibly find, I have to admit, I like how clutter free the closet looks and feels. I also used the bins to house their shoe collection. Since they have small feet, it all fit into the bins nicely. Is their a certain folding technique I should use? We also spoke a bit about the KonMari method and although I think that is a wonderful solution, I did not think that it would work in this room. 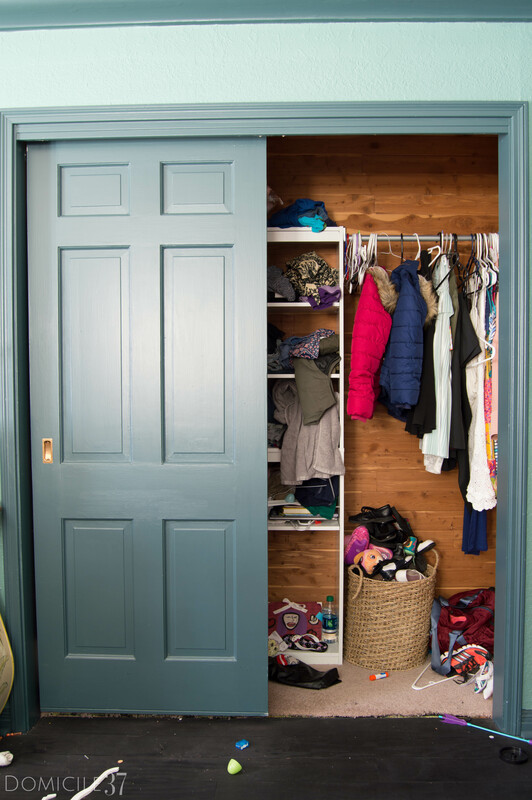 All three of my kids (ages 9 and below) share this closet and if you follow me on instagram, you know I have one child that refuses to do any type of chore…that includes folding. With that in mind, I made the executive decision to hang their tops and dresses and to fold and put their bottoms in bins. How many articles of clothes is enough for kid? Should they have x amount of dresses, x amount of shirts, etc…? She addressed this question when we were discussing organization as a whole…there is no exact formula to how much clothing a kid should have. As a child my mother used to allow us to have X amount of clothing, so I thought that I should do the same with my kids. After hanging up and organizing their clothes, I realized they do not really have that much, it just looks like it because they just throw it in the closet. To help with decluttering their stuff, I ended up storing seasonal clothing on the top shelf in color-coded bins so that I know which bin belongs to which child. Since they share this closet would it be wise to add a bit of toy storage in here? Since this closet is huge (you are only seeing a small portion) I asked Jessica if it would be feasible to add toy storage in here, she responded by saying, “yes”. After organizing this closet, I realized that ALL of the kids clothes fit on one side of the closet leaving me to use the other side for house storage. This revelation, has given me the confidence to know that whatever switch-a-roo I make in the near future when it comes to my kids rooms and toy closet that I will be able to house whatever they need (toys, clothes, etc…) in this closet without any problem. After my consultation with Jessica, I started wishing that I had a California Closets located near me, because I need help with it all. 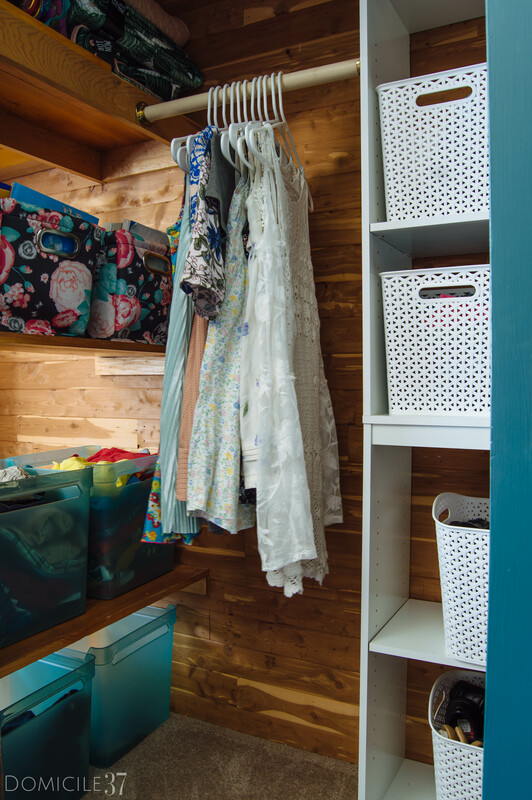 California Closets offers custom organizational solutions throughout the home, from pantries to closets, to mud rooms and laundry….They do it ALL! They enhance the storage potential of even the smallest space and guys, this is what I need! This may sound crazy, but I even have empty cabinets because I don’t know what to put in it. Since, I wasn’t able to get an at home consultation Jessica was kind enough to walk me through what a normal consolation would be like. An at home consultation would begin with an introductory call or email where the design consultant will confirm the time and day of the consultation, address and if there are any additional details prior to meeting. On the day of the consultation, they show up with clipboard in hand to jot down ideas, details, questions,etc… Like all meeting, there is a time to work and a time to play, so during this first consultation it is really important for the designer to give them an idea of what the consultation will include and what the next steps will be. Measurements are taken and a variety of questions to find out what the client’s needs and wants are, with the designer paying close attention to their trigger points and identifying what is most important to them. The design consultant then measures how much hanging space the client is are currently using, quantity of shoes, hand bags, drawers etc.……This helps them explain new design and comparing what they are currently using and what they will be gaining. Lastly, they take before photos for their portfolio. After measuring, the design consultant will recap with the client their needs and explain a little bit more about our products offering that apply to their project. During this time the design consultant will share her samples/finishes with their client. It is important to note, California Closets has a extensive range of beautiful finishes to choose from all of which are environmentally sustainable and California Air Resource Board (CARB) compliant. The design consultant can then use their iPad with a California Closets app to share examples of similar spaces installed. This is a great segue into the pricing discussion since our wood finishes are broken into 4 price groups. This is where budget, decision makers, timing, other possible projects going on at the same time are broken down and mentioned. 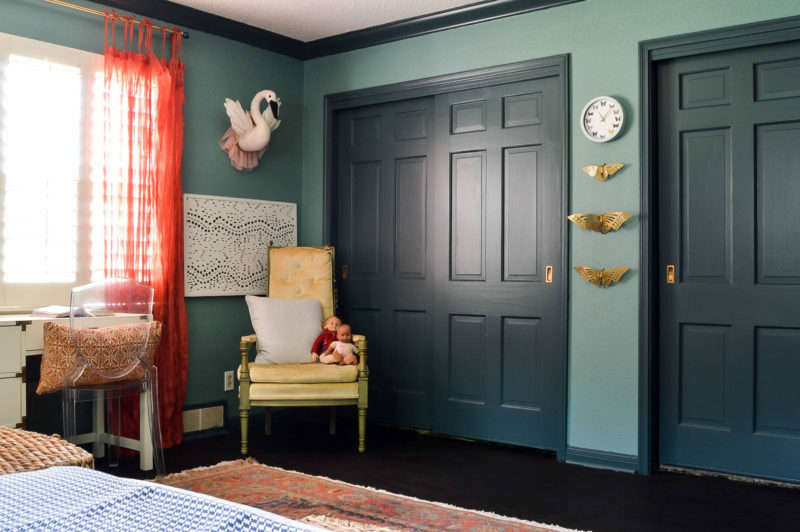 The design consultant will then come up with a preliminary design and review it with their client so that they can make adjustments to either add more bells and whistles or scale it back to be more in alignment with their budget. Jessica expressed that every scenario is different so there are times when design consultants design right on the spot if the project is small enough or if the client has at least 2 hours to spend with them. Most of the time they prefer to set up a follow up appointment at our nearest showroom to present their designs and cost. Ideally this would be coordinated with all decision makers involved so I can address all the questions they might have. Like with all makeovers, it is important for the design consultant to encourage clients to visit a showroom to see our product line in person so they know what quality and workmanship to expect. This way there are no surprises on installation day. Once designs have been presented and costs have been discussed a 3D images of their design and ask how they would like to proceed. I had a blast working with Jessica from California Closets. Not only was I able to get insider tips on how to organize the most challenging space in my home, I realized that functionality within a space can also be beautiful. I love how the closet came together and I cannot wait to organize more of my home using the tips I learned from California Closets. 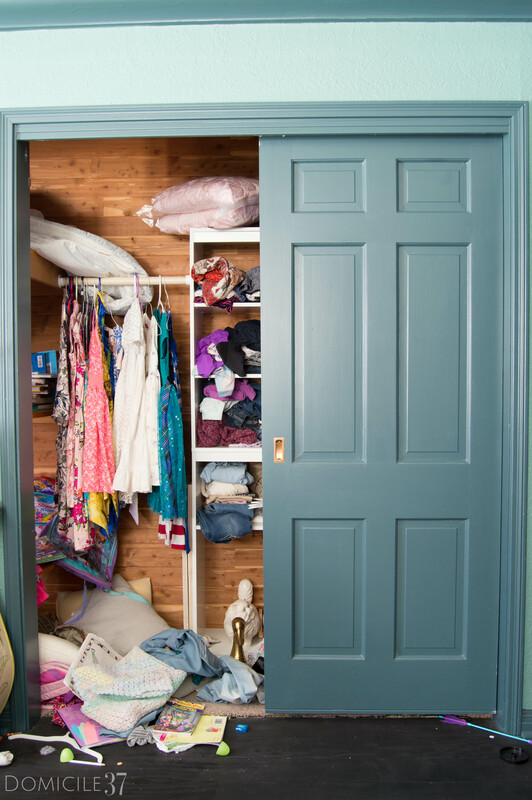 I was able to get help and so can you, remember California Closets has professional design consultants that can collaborate with you to create an organized and functional space created in your personal style and budget. I was selected for this opportunity as a member of Clever and the contents and opinions expressed here are all mine.